Cook the pasta according to package instructions. When there is roughly 1 minute left add the frozen peas in so they thaw. While the pasta is cooking, add the bacon to a large nonstick skillet and cook over medium heat until crisp. Chop the bacon into small, bite-sized pieces, and set aside. Crack the eggs into a bowl, add ½ cup of Parmesan cheese, and the pepper. Whisk together until the egg yolk and white are fully combined. Drain pasta and peas, keeping ¾ cup of the water. Set water aside. 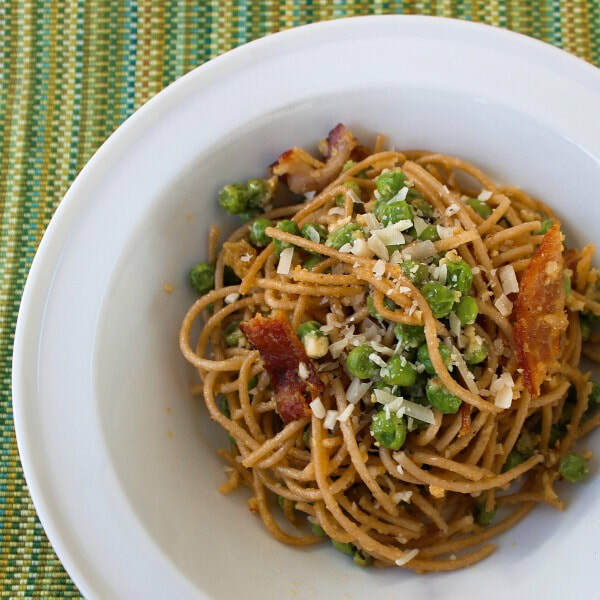 Pour the hot pasta and peas, egg mixture, bacon, and ¾ cup of water into the skillet. Heat the skillet on low and stir constantly so that the egg mixes evenly and does not scramble. Continue stirring and leave on heat until the egg is cooked. Serve each portion with 1 Tbs of the leftover Parmesan cheese.